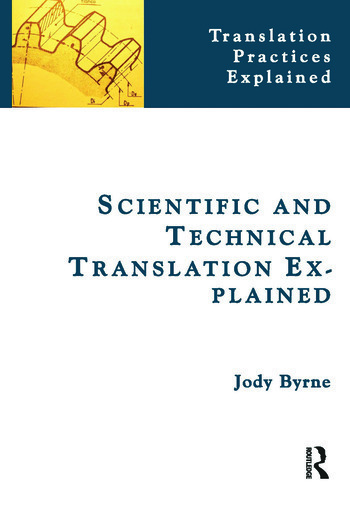 Scientific and Technical Translation Explained provides an overview of the main features of scientific and technical discourse as well as the different types of documents produced. A series of detailed case studies highlight various translation challenges and introduce a range of strategies for dealing with them. A variety of resources and exercises are included to make learning effective and enjoyable. Additional resources and activities are available on Facebook. 1.2 A place for translation theory? 1.4 Who’s who in scientific and technical translation? 2.2 What is technical communication? 2.3 Who reads technical documentation? 5.3 What type of translation are you producing? Jody Byrne has been a professional technical translator since 1997 and has taught translation and localization at Dublin City University and the University of Sheffield. He holds a BA in translation and a PhD in technical translation and is the author of Technical Translation: Usability Strategies for Translating Technical Documentation (Springer, 2006) as well as numerous other publications on technical translation, professional communication and usability. He is a professional member of the Irish Translators’ & Interpreters' Association and a fellow of the Institute of Scientific & Technical Communicators.